If you love carpet flooring then you enjoy the comfort and warmth of a soft surface. On a colder day there is no beating the relaxing comfort of a warm carpeted floor. No matter what your preference is for carpeting, we have a style and color (and price) to suit your project. Carpet tiles are an excellent solution for both the home and for commercial environments. More frequently seen in business or retail environments, the carpet is laid in a decorative pattern or as a solid. 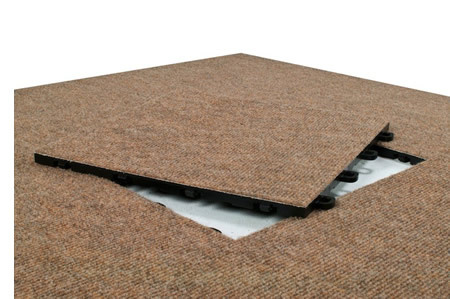 The carpet tile is manufactured from a stick-backed material which makes it rigid and durable. This type of flooring is ideal for high traffic areas where sections of the carpet may become worn or faded over time. It is far easier to replace individual carpet tiles (and economical) than it is to replace an entire carpeted floor, which is why businesses and institutions prefer them for indoor flooring. They are also excellent in sunrooms or outdoor additions, home gyms and recreation rooms. Ask us to help you pick the right flooring for your home or commercial project. Contact us for more information.